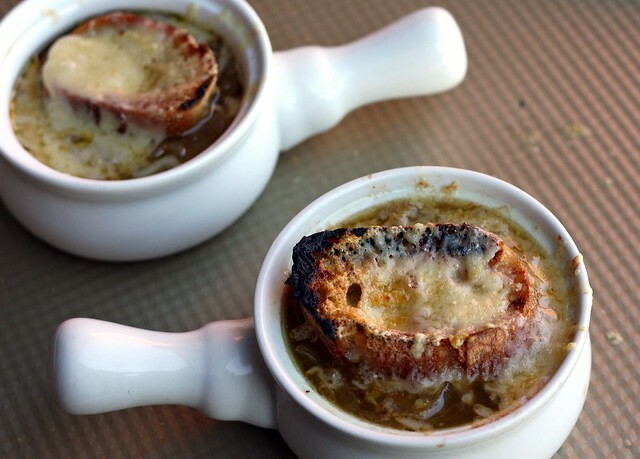 French Onion Soup – Elly Says Opa! I can’t tell you how many restaurants at which I’ve eaten French onion soup. Basically, if it’s on the menu, I order it. This is a trait I’ve inherited from my dad, a man who only eats meat, potatoes, Caesar salad, and French onion soup. Tom (and a couple of our friends) always makes fun of me, because it’s not exactly the most attractive thing to eat out in public, what with trying to get gooey cheese into your mouth, while attempting not to slurp it in, Lady and the Tramp style. But, I don’t care. I love French onion soup. 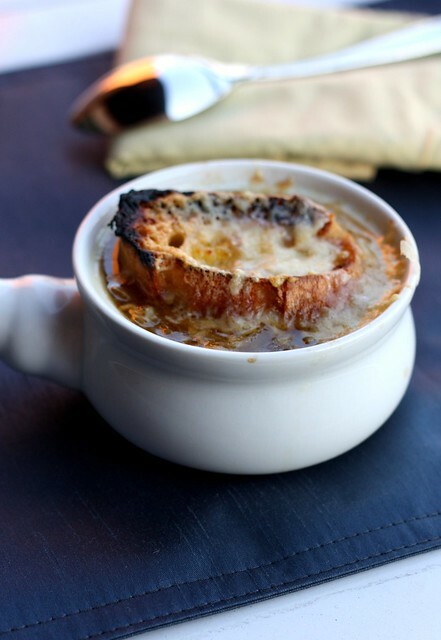 I’ve made French onion soup many times, but it’s never really made it to the blog. Well, it sort of did—nearly 5 years ago—and without a picture. I haven’t changed the recipe much since then, but I have made a few tweaks, including reducing the butter and increasing the booze. I’ve tried many versions of this soup and always prefer a higher beef broth to chicken broth ratio. I’ve tried red wines and fortified wines, and my favorites have been sherry or vermouth—but really, you can use whatever you want and it will still be great. I love this soup not only for its depth of flavor—achieved from caramelizing the onions, then cooking them in the wine, and the combination of a stronger beef broth with a lighter-flavored chicken broth—but also because it includes crusty bread and bubbly cheese, two of the best ingredients around. And, though I will continue to order it in restaurants time and time again, it’s great to eat it at home where others are eating the same thing, so you can all deal with the gooey-cheese-getting-into-your-mouth escapades. Use a large (at least 6 qt.) Dutch oven or pot, melt the butter over medium heat. Add the onions and thyme and cook, stirring frequently. After a few minutes, add a pinch of salt. 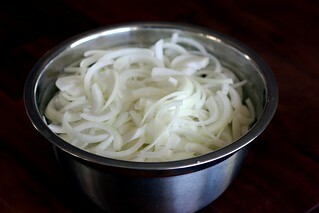 Continue cooking and stirring until the onions have wilted down and have begun to turn golden brown, about 25-30 minutes. Add the sherry and continue to cook until it has been absorbed by the onions, and the onions are dark brown in color, about 15 minutes. Stir in the beef and chicken broth, and the bay leaf and bring to a boil. Reduce the heat and simmer for 30 minutes. Season to taste with salt and pepper. Place baguette slices on a broiler-safe pan, and broil until toasted - not long, about a 1 minute. Rub the baguette slices with the garlic clove while still warm. Leave the broiler on. Place 6 broiler-safe bowls on a baking pan. Ladle the soup into the bowls, and top each bowl with a slice or two of baguette and a handful (or slice) of Gruyere. Broil until cheese is melted and browned, a few minutes.